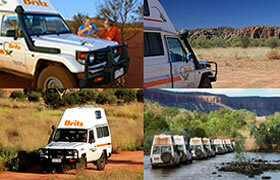 14 Day Tag-a-Long Package -"Kimberley Remote"
This package is a Guided self drive tour. The following itinerary is designed to take you safely to the remote parts of the Kimberley. You will be travelling in your own vehicle with a group of other like minded travellers. The tour will be led by an experienced guide who will be driving their own lead vehicle with all the necessary experience and equipment to ensure your safety. This package offers the Ultimate remote Kimberley Experience. Arrive in Broome & pickup your vehicle from the depot. 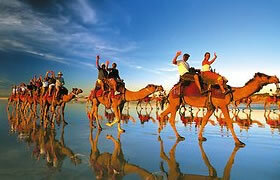 The group will meet up at 1.30pm in their vehicles at Cable Beach. You will be welcomed by your guide where you will be given a debrief of the tour and the chance to meet your fellow travellers. Depart Windjana Gorge and back onto the Gibb River Road as the group is guided into Bell Gorge for Lunch. Bell Gorge is located within the stunning King Leopold Range National Park and is one of the most picturesque gorges in the Kimberley. You will have ample time to swim, take photographs and bushwalk. After lunch its off to Charnley River Station where you will have time to begin exploring this 750,000 acre working cattle Station. You will meet station owners Peter and Cheryl Camp where you will get an insight into remote country living and get to meet the stockmen, jackaroos and jillaroos who work on the station. Day 5 the group departs Charnley Station and heads through the heart of Kimberley cattle country to discover some of the regions most secluded gorges. At Galvans Gorge, a short walk leads to a picturesque waterhole, with Boab trees clinging to the escarpment above. Inspect the rock art on the gorge walls and take a leisurely swim. You stop at the Mt Barnett Roadhouse before travelling to beautiful Barnett River Gorge, where you can enjoy lunch in a setting of shady paperbark trees. Turning off the Gibb River Road, you will travel north on the Kalumburu Road, heading towards Mitchell Plateau. Ford the Drysdale River and, late this afternoon, the group will arrive at camp on the banks of the upper King Edward River. Day 7 Mitchell Plateau, King Edward River. Travelling through Livistona palm forests, you will say goodbye to the awe inspiring scenery of the Mitchell Plateau. Lunch is at a majestic spot alongside the cool waters of the King Edward River, surrounded by pandanus and weeping melaluca trees. There is time for a swim before continuing to camp, situated on the banks of the upper King Edward River in a tranquil bush setting. Day 8: King Edward River to El Questro. Day 8 say goodbye to the and head down the Gibb river road into El Questro the world famous 1 million acres cattle station that has been made into a wilderness park. The section of road between Mount Elizabeth and El Questro offers excellent scenery and offers some challenge and adventure as you cross the mighty Pentecost River. At El Questro you will have an opportunity to check into your accommodation or set up camp. A free afternoon to enjoy the spectacular scenery, bushwalk or fish. Day 10: El Questro to Kununurra. A full day to relax and explore the simply awesome Bungle Bungles. A short drive to the start of the walk to Cathedral Gorge gets you up close to the widely photographed beehive domes. Cathedral Gorge is incredibly stunning with its towering beehive cliff faces and cold pool of water fringed by a sandy beach. Later in the day you will drive the full length of the Bungles to Echidna Chasm, Frog Hole Gorge & Mini Palms Gorge where you will experience a very different aspect on the Bungles. Day 13 the group will depart the Bungles and drive to Fitzroy Crossing. Along the way the group will have the chance to explore Halls Creek and its nearby attractions including China Wall & Old Halls Creek. Further along the group will stop for Lunch. After lunch at Mary Pool the group will continue the journey along the Great Northern Highway to Fitzroy Crossing. On arrival in Fitzroy Crossing you will check into your accommodation or your camp site before relaxing and spending whats left of the day or evening. Late afternoon the group will meet for the last night of the tour together with a BBQ Dinner. Day 14 the group will spend the morning by travelling up to Geikie Gorge and explore an amazing example of the wonders of the Devonian reef. The group will spend the morning driving the 400km back to Broome to return your vehicle and depart Broome. 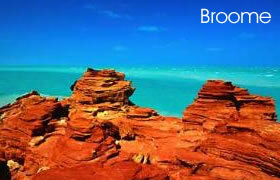 Depending on what time you are departing Broome you have the option to explore some of Broome's attractions. 2 nights Deluxe Safari Tent with wooden timber floor & own ensuite.